Racin’ Today » Coughlin Passes Tests On And Off Track In Wash. 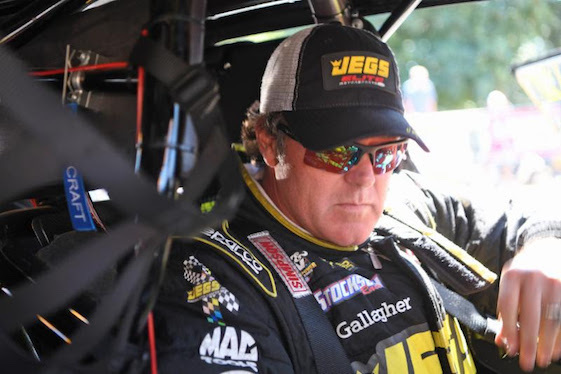 Pro Stock driver Jeg Coughlin Jr. survived a rules challenge by fellow competitor Chris McGaha to claim the pole in the Northwest Nationals. Coughlin’s pole-winning pass at Pacific Raceways in Kent, Wash., was protested by Chris McGaha, who questioned the legality of the Jegs.com/Elite Performance Chevrolet Camaro SS. By NHRA rule, any competitor can challenge the legality of any other car, but the protesting party must stipulate how the accused party is cheating and pay a $1,000 fee. After Coughlin covered the traditional quarter-mile in 6.501-seconds at 212.16 mph Friday night to earn the provisional pole, McGaha decided that Coughlin and Elite teammate/two-time world champ Erica Enders must be fudging the rules. McGaha then posted $2,000 to file a protest on each driver’s car. Both vehicles were thoroughly inspected and subsequently deemed legal, so Coughlin and Enders were handed the cash. “Not sure what was going on there but we’ll chalk that up as a flattering experience and enjoy a little party money for Saturday night,” Coughlin said. “Yeah, it’s kinda funny. I guess you look at it after racing for 30 years, we’ve been torn down and checked by the NHRA Tech department many times and never had an issue. Steve Torrence (Top Fuel) and Matt Hagan (Funny Car) also secured poles in their respective classes in the 16th of 24 events on the 2018 NHRA Mello Yello Drag Racing Series schedule. Sunday’s race also is the third and final stop of NHRA’s annual summertime Western Swing through the Denver, Northern California and Seattle markets. The FOX Network will air three hours of finals coverage Sunday beginning at 4 p.m. (EDT). Coughlin’s 25th career pole followed his third Pro Stock win of the season last weekend at Sonoma (Calif.) Raceway. Overall, Jeggie owns 80 career wins _ 61 in Pro Stock and 19 in various Sportsman categories. “We’ve made some great runs in qualifying here and we’re excited to continue the momentum from Sonoma,” Coughlin said. “We opened Friday with a great 6.505-second pass and ended up No. 2 after the first session. We came back in the evening session and the track was cooler so we were hoping to tap into the 6.40s but we ran the 6.501 and that was good enough to move us up to No. 1 and keep us there. Coughlin will attempt to secure his first victory at Pacific Raceways since 2002 when he opens eliminations Sunday against No. 16 qualifier Joey Grose and his Camaro. Point-leader Greg Anderson qualified second at 6.503-seconds and 211.79 mph Friday in his Ken Black Racing Camaro. The four-time world champ will meet Steve Graham in Round One. Hagan, a two-time world champion at Don Schumacher Racing, secured his fourth Funny Car pole of the season and first at Pacific Raceways via his 1,000-foot run of 3.913-seconds at 324.75 mph from Friday night. Fourth in the championship standings, Hagan will chase his third victory in five races Sunday when he opens against two-time world champion Cruz Pedregon. Two-time/reigning world champ Robert Hight secured the No. 2 position in his Chevrolet Camaro SS with a pass of 3.919-seconds at 327.82 mph during the second qualifying session. Hight, of John Force Racing, will open against veteran independent campaigner Gary Densham. In Top Fuel, category leader Torrence continued to extend his point lead by securing his second No. 1 position of the year, as his 1,000-foot pass of 3.723-seconds at 331.61 mph in the Torrence Racing dragster from Friday held serve. Doug Kalitta sits second in team-owner Connie Kalitta’s Mac Tools dragster after a pass of 3.730-seconds at 326.00 mph on Friday. Doug Kalitta will meet Bill Litton in the first round. Top Fuel _ 1. Steve Torrence, 3.723-seconds, 331.61 mph vs. 16. Ron Smith, 4.861, 190.08; 2. Doug Kalitta, 3.730, 326.00 vs. 15. Bill Litton, 3.970, 307.86; 3. Clay Millican, 3.743, 330.47 vs. 14. Jim Maroney, 3.932, 283.13; 4. Tony Schumacher, 3.751, 327.11 vs. 13. Terry McMillen, 3.891, 311.34; 5. Antron Brown, 3.761, 330.80 vs. 12. Shawn Reed, 3.869, 318.84; 6. Leah Pritchett, 3.764, 322.34 vs. 11. Troy Buff, 3.867, 304.80; 7. Mike Salinas, 3.768, 327.98 vs. 10. Scott Palmer, 3.815, 323.81; 8. Brittany Force, 3.785, 326.32 vs. 9. Richie Crampton, 3.792, 323.50. Funny Car _ 1. Matt Hagan, Dodge Charger, 3.913, 324.75 vs. 16. Cruz Pedregon, Toyota Camry, 4.182, 296.63; 2. Robert Hight, Chevy Camaro, 3.919, 327.82 vs. 15. Gary Densham, Ford Mustang, 4.085, 309.98; 3. Courtney Force, Camaro, 3.927, 325.69 vs. 14. Jim Campbell, Charger, 4.073, 307.09; 4. Bob Tasca III, Mustang, 3.943, 321.19 vs. 13. J.R. Todd, Camry, 4.056, 315.71; 5. Tim Wilkerson, Mustang, 3.963, 320.58 vs. 12. Richard Townsend, Camry, 4.041, 305.84; 6. Shawn Langdon, Camry, 3.977, 325.37 vs. 11. Jack Beckman, Charger, 4.028, 317.79; 7. Tommy Johnson Jr., Charger, 3.977, 321.35 vs. 10. John Force, Camaro, 4.028, 318.39; 8. Jonnie Lindberg, Mustang, 3.995, 315.42 vs. 9. Ron Capps, Charger, 4.008, 319.22. Did Not Qualify _ 17. Jeff Diehl, 4.211, 289.94; 18. Terry Haddock, 4.299, 289.32. Pro Stock _ 1. Jeg Coughlin Jr., Chevy Camaro, 6.501, 212.16 vs. 16. Joey Grose, Camaro, 6.708, 206.80; 2. Greg Anderson, Camaro, 6.503, 211.79 vs. 15. Steve Graham, Camaro, 6.637, 209.07; 3. Erica Enders, Camaro, 6.506, 212.66 vs. 14. Alan Prusiensky, Dodge Dart, 6.615, 209.01; 4. Tanner Gray, Camaro, 6.510, 212.09 vs. 13. Fernando Cuadra, Camaro, 6.564, 210.54; 5. Jason Line, Camaro, 6.518, 211.73 vs. 12. Matt Hartford, Camaro, 6.557, 209.95; 6. Deric Kramer, Camaro, 6.522, 211.56 vs. 11. Drew Skillman, Camaro, 6.553, 211.13; 7. Bo Butner, Camaro, 6.526, 211.96 vs. 10. Alex Laughlin, Camaro, 6.541, 210.80; 8. Vincent Nobile, Camaro, 6.527, 211.33 vs. 9. Chris McGaha, Camaro, 6.541, 211.83.